When did you first envision the project? I really started putting together the idea on January 1, 2012. I’d been wanting to make some sort of comic book story that was within a hip-hop environment. I love the fashion of old hip-hop, graffiti. New York when it was super gritty, like from a Scorsese flick. It just made sense to do a linear, straightforward 'history of rap music' comic. I have a lot of trivial knowledge about hip-hop to start, and I could play that six degrees of separation game with most rappers and take it back to the South Bronx after a few generations. It just made sense to tell the story in this way. It’s about rap music, but not really. 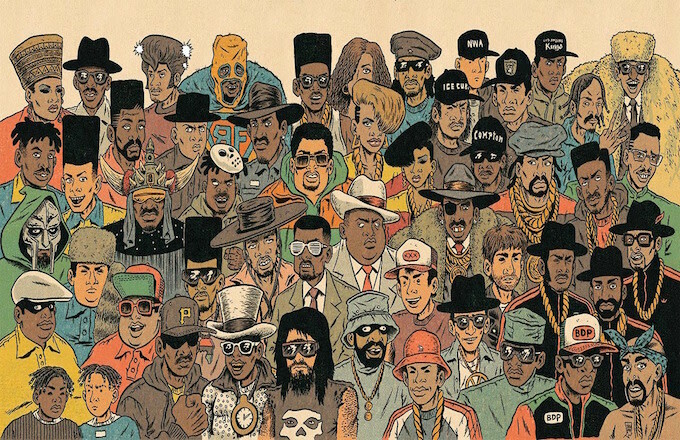 Is there a story from the beginning of rap that was a favorite of yours to tell in comic form? Yeah, tons of them! The one that a lot of people seem to latch onto is in that first book, the Blackout of ‘77. Grandmaster Caz and DJ Disco Wiz are doing their thing, and then the blackout happens. It’s a legendary story and the conceit of this story is that while the riots were going on during the blackout, the next day a lot of DJs started to show up on every block in New York because they were able to acquire and pilfer the necessary speakers, record players, and records to have a strong DJ arsenal. I just like the idea of that.